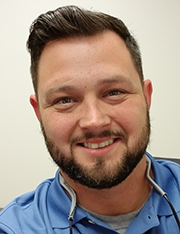 Jarret Floyd has joined Mickey Truck Bodies as Parts Director, responsible for the day-to-day operations of the Parts Team. He reports to Kyle McLaughlin, VP Reconditioning & Parts, and joins teammates Rocky Barham, Herb White, Matt McSwain and Mike Rabon, Jr.
“Jarret has over 13 years of experience as a Parts Manager and Technician with a successful track record in the areas of marketing, customer relations and inventory control,” says Kyle. Prior to joining Mickey he was Parts Manager with James River Equipment, a full-service equipment and tractor dealership, in its Pfafftown, NC location. Before that he was Parts Manager, Technician and Salesman for Webster Brothers Hardware in Walkertown, NC.